UNL third and fourth year architecture students, along with Professor Martin Despang, returned to Boone County to display their work to the public last Saturday, March 27. Their first stop was the St. Edward Community Center, to show designs for a new community gathering place. 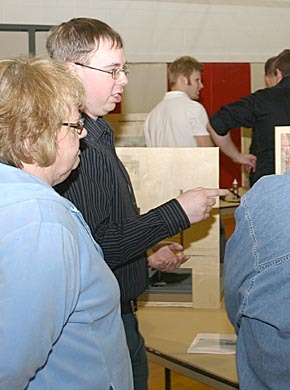 In the afternoon, the students displayed designs for a possible new performing arts center on the southeast corner of the Boone Central School grounds in Albion. Details in the March 31 Albion News Print Edition.